Last year... on the last day before I started back to school I spent an entire day making Peach Ice Cream. Not only did I make this peach ice cream, but I planned it, dreamt about it, researched it.. and then finally spent an entire day making it. Please see what I mean ..here.. So, here it is the first week of school again.. and this time... 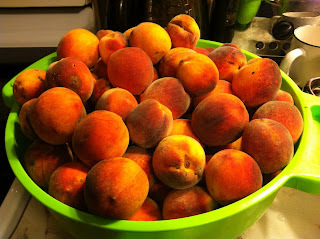 I was surprised with a huge bowl of tiny peaches fresh off Sarah Robicheau's organic Peach tree from her front yard. 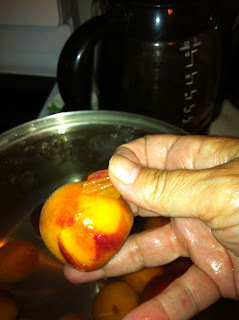 I forgot them at school yesterday and last night I was dreaming of peaches.. and researched some cool peach recipes. I decided on making peach Jam and "Pinned" several different recipes... most including some form of alcohol. (Is this a sign of something). After a long, and nerve wrecking day (first day of school, I mean)... it was with a smile on my face, that I sat at the diningroom table with my large bowl of peaches and started peeling and pitting them. 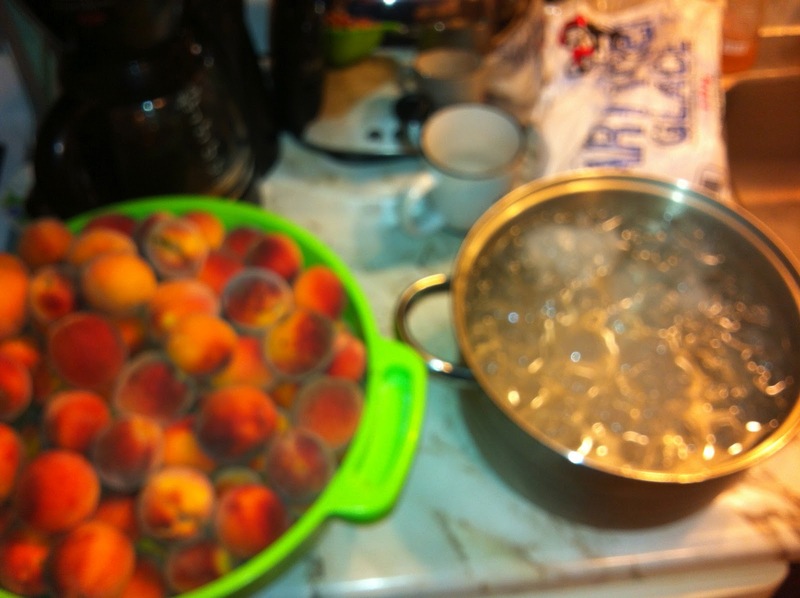 I did parboil them for about 2 minutes first, then plunged them in ice water for a few minutes first.. which made the skins come off fairly easily.. and then I just crushed the peaches with my hands to get all the flesh off the stones. 12 lbs of little peaches... and it makes about 8 lbs of peach meat. 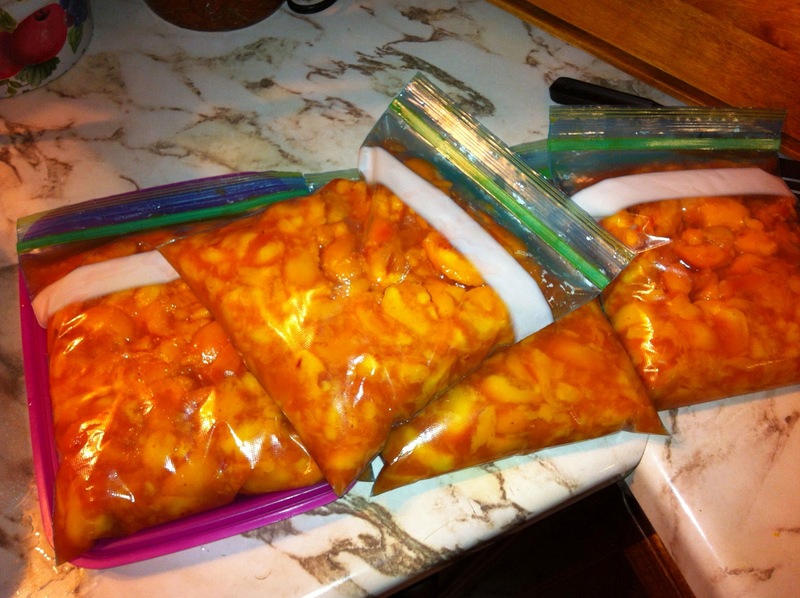 I mixed lemon juice with the peaches and divided them in bags and popped them in the freezer for a day.. because I wasn't ready to make jam right away. I "googled" peaches and they freeze fine.. especially if they are for making Jam. I will try to make a few different types of peach jam. Two different kinds of Peach Jam, each with some sort of alcohol in it.. white wine in one.. and vanilla bourbon in the other. Plus, Debbie says she has a great recipe for Peach something, and I also got a recipe from another friend for Peach Marmalade.. so.. here's thinking positive!